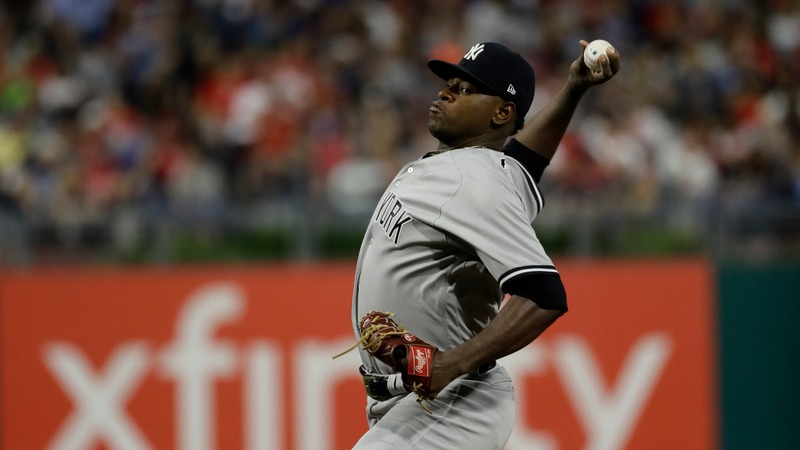 After getting shelled by the Boston Red Sox on Saturday, the Yankees have ace Luis Severino going on Sunday against David Price. After Boston destroyed the Yankees at the plate and on the mound on Saturday, New York gets its ace for an important Sunday showdown. __Odds: [Red Sox (56-28) +175 at Yankees (53-27) -190](https://www.betchicago.com/mlb-betting/odds), Total: 8 (UNDER -105) 8:05 p.m. ET__ The Red Sox did not just dismantle the Yankees on Saturday, but their 11-0 win over the Pinstripes was a study in ruthlessness. A night after the Yankees won 8-1, Boston's sensational Chris Sale allowed just one hit in seven scoreless innings and struck out 11, while Rafael Devers delivered a grand slam and a double in a 5-for-5 performance. But even coming off such an absolute throttling, the Red Sox are still +175 on Sunday. Why? Because the Yankees' star pitcher, Luis Severino, is back on the mound seeking his fourth straight win. Severino is 12-2 on the season with an American League-leading 2.10 ERA, a big reason why the betting total of eight runs stands out. Boston has no slouch on the mound either, as David Price looks for his eighth win in his last 10 starts since early May. With two studs on the mound, something's got to give. __Trends:__ The Red Sox are 4-0 in Price's last 4 starts vs. American League East. The Yankees are 8-1 in Severino's last 9 starts vs. American League East. The UNDER is 13-3-1 in Yankees last 17 home games. __Sunday’s MLB Notebook__ *Stats are as of Saturday, June 30. __Odds: [Braves (47-34) -105 at Cardinals (42-39) -105](https://www.betchicago.com/mlb-betting/odds) Total: 8.5 (UNDER -105) 2:15 p.m. ET/1:15 p.m. CT__ Mike Foltynewicz, who sports the National League's third-lowest ERA (2.14), will take the mound for Atlanta on Sunday as the Braves look to sweep the Cardinals in St. Louis. The Cards will counter with John Gant, which is not much of an effective counter, as the Cards are 1-5 in his last six starts. The Braves got dominating performances on Saturday from both Max Fried, who allowed four hits and zero runs in 6 2/3 innings while striking out 11, and Nick Markakis, who hit a grand slam in the 11-4 win. __Trends:__ The Braves are 4-1 in Foltynewicz's last 5 starts. The Cardinals are 1-5 in Gant's last 6 starts. The OVER is 5-1 in Braves last 6 road games. __Odds: [Indians (44-37) -130 at A's (46-38) +120](https://www.betchicago.com/mlb-betting/odds) Total: 8.5 (UNDER -120) 4:05 p.m. ET/3:05 p.m CT__ Journeyman pitcher Edwin Jackson picked up his first win of the season on Saturday in a 7-2 A's win over the Indians, but even six straight wins (tied with Seattle for the longest current streak in the majors) isn't enough to make Oakland the favorites on Sunday in the final game of the three-game set. Cleveland is -130 as of Sunday morning, with Mike Clevinger on the mound after the A's mowed down Trevor Bauer and Adam Plutko, a pair of UCLA products, on consecutive days. Clevinger is 6-3 on the year with a 3.03 ERA and 94 strikeouts in 104 innings, and he'll be matched up against Frankie Montas, who is 4-1 with a 3.68 ERA __Trends:__ The A's are 5-0 in their last 5 games vs. a right-handed starter. The Athletics are 5-1 in Montas' last 6 starts. The UNDER is 7-1 in Indians last 8 road games.